The fungus causes swollen or sunken orange-colored cankers on the limbs and trunks of the chestnut trees. The spores enter into the tree by cracks and wounds in the bark. The fungus then spreads into the inner portion of the tree and girdles the tree. The leaves above the point of infection die, followed by the limbs. Within two to ten years the entire tree is dead. The cankers spread, encircle the stem, and kill the tree above the point of infection. In the early 1900s the Queen of the Forest, the Redwood of the East — the majestic American Chestnut suffered greatly. Today, an American Chestnut can grow until about 5-10 years old before it gets the blight. Then, it’s growth is stunted and it keeps dying back and growing again — never reaching maturity. I think it’s hard for folks in this day and age to grasp what a vital part of the ecosystem these trees played. They were a keystone species in the Eastern forest providing mast (food) for numerous wild animals, food for the indigenous and the settlers, and its ecological function as a canopy tree is unsurpassed. The American Chestnut Foundation is trying to remedy this. They have begun to hybridize the American Chestnut with the Chinese Chestnut. The Chinese Chestnut is actually immune to the blight. The blight was said to have been spread to the Americas through trees/plants from China. They are working on developing a tree that looks like the American Chestnut yet behaves (meaning the immune system) like a Chinese Chestnut. So, that’s why we eat chestnuts from other species of chestnuts and not our native, eastern chestnut. 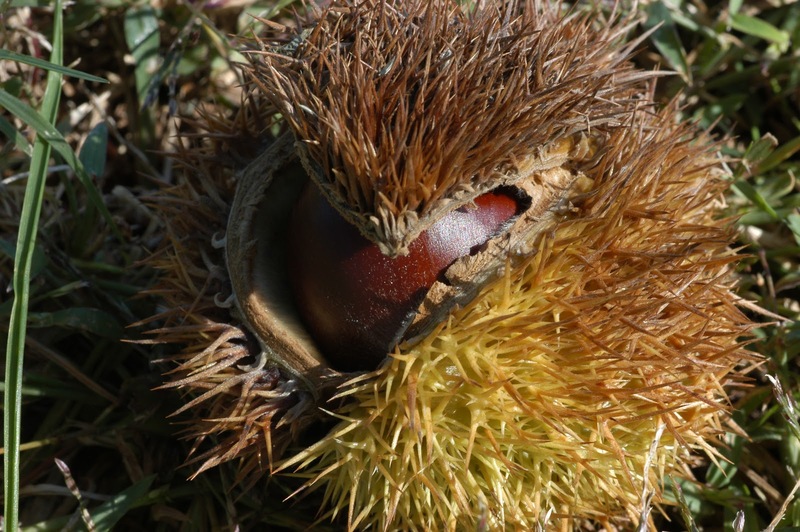 The European settlers that came to this country were well-acquainted with this tree because Sweet Chestnut was very common in most of their countries of origin. These chestnuts were commonly used to make pasta, breads, purees for sweets, soups, and even brewed for beer. Today, on the streets of many European cities, it’s the time of year where it is common to inhale the wafting smell of cooked chestnuts from street vendors. You can buy a small bag of warm chestnuts as you walk to your errands or to work. I just tried a couple of recipes that worked out really well. One is a soup recipe that I adapted from Sally Fallon’s Nourishing Traditions and the other is a cookie or a macaroon recipe that I simply made-up. Oh, and another interesting thing about chestnuts is that they are actually regarded as vegetables because of their low fat content and their high carbohydrate content (lending to their sweet taste). Like other nuts, though, they are packed with vitamins and minerals…especially trace minerals which are rare in our modern diet. The tree roots of all nut trees dig really deep into the earth to bring us hard-to-reach trace minerals in a form that is easy for us to digest. Enjoy the recipes! Preparing the chestnuts: Make ‘x’ marks on their rounded tops, place them on a cooking sheet, and bake them in the oven for 15 min at 425 degrees. Let cool and take the shells off. Cook the carrots and onions in the butter until soft. Add the vinegar, stock and chestnuts. Bring to a boil and then turn down to simmer. Add spices and salt. Let simmer for 15 minutes. Puree the soup with a handheld blender (or an upright one). Season to taste. Ladle into bowls and serve with kefir and parmesan cheese. Mix all ingredients in a bowl. Take spoonfuls of batter out and form small, 2 inch ovals in your hands and place on a parchment-lined baking sheet. Place in the oven at 300 degrees and bake for 45 minutes or until the bottoms of the cookies are golden brown. Let cool and enjoy!